One of the most popular tour: a chauffeur driven car tour in Milan. The reason? Simple, this city is a good starting point to reach other places, for business or leisure travel. With our service you can reach the airport or the train station to get to any destination or luxury hotels. You can choose to enjoy the city, one of the most beautiful in Italy. Our driver waits for you at the hotel (or the station, airport, restaurant) and takes you on a fascinating journey in a city that everybody dreams of: Piazza del Duomo (Cathedral Square), the Galleria Vittorio Emanuele II, the Scala Theatre, the Sforza Castle. Without forgetting the famous fashion streets as Via Manzoni, Via Montenapoleone, Via della Spiga. Piazza del Duomo is the true center of the city. The Gothic style cathedral is the fourth largest church in the world. 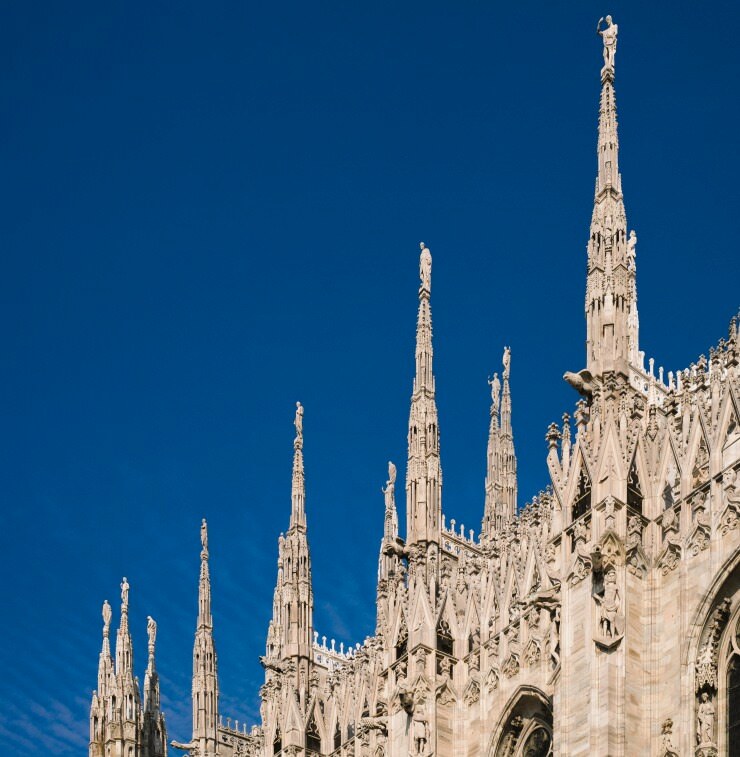 The Duomo is 157 meters long and can accomodate 40,000 people: it is very popular for its façade and its openwork pinnacles that are separated by a forest of spires with statues overlooking the city. The huge building is made of brick, covered with marble from the Candoglia quarries near Lake Maggiore. From the Cathedral you can see the famous Galleria Vittorio Emanuele II. The second stopover of the tour will be the Sforza Castle, which is located in front of the Duomo as the crow flies. The Sforza Castle was the residence of the dukes of Milan and its construction began in 1360. To date, the castle houses some municipal museums and permanent exhibitions, such as an art gallery with 230 Italian painting masterpieces focused on art from the regions of Lombardia and Veneto. A few steps from the castle you will enter in the most important fashion streets of Milan, where you can admire the shop windows of the most renowned brands. You will visit Via Manzoni, Via Montenapoleone, Via della Spiga with our driver. If you love the world of luxury and fashion, it will be easy to lose track of time here. To make better use of time you can contact a personal shopper who will bring you to the most refined places in Milan. What does the chauffeured car hire service to Milan include? Our service includes local experienced driver, luxury car, assistance from our office, car insurances required by law. More information on the Milan tour? Just ask and we will customize everything. On request we can reserve a table at your favorite restaurant, provide you a professional guide or buy tickets for museums. The chauffeured luxury car hire Milan tour by Clab Service is available every day of the year. Book now! Do you want more information on our chauffeur-driven car hire service? Send us an email and book your travel experience.